Today most everyone has a GPS at their disposal, but if you like to have a map in hand, just give us a call. 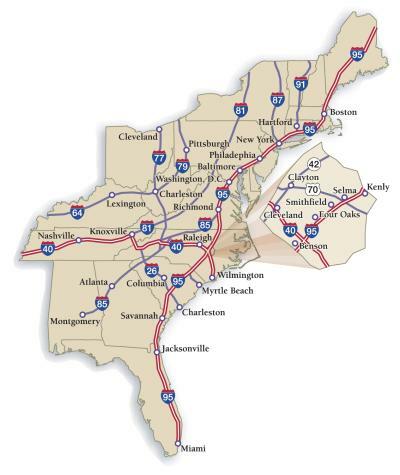 It&apos;s a straight shot along our major Interstates 95 and 40 to Johnston County, making our county the North-South and East-West connection in North Carolina. Johnston County is located in the Piedmont Region of North Carolina, just 30 minutes from Raleigh, our state capital. RDU International Airport is 30-45 minutes west from Johnston along the I-40 corridor with 250 daily flights. AMTRAK in Selma offers two daily trains for rail passengers. Mid-way along I-95, Smithfield in Johnston County is approximately the 0 mile marker between New York City and Jacksonville, Florida. Check our mileage chart for more key travel points to the county!